EMPLOYER SERVICES Recruitment and placement of experienced professionals. Since we presently utilize several methods of recruiting candidates, such as advertising, direct mail, telephone recruiting, and referrals, we are an excellent source of experienced candidates for you. We employ experienced consultants who will work with our client employers on an "account executive" basis; which insures more precise referrals. 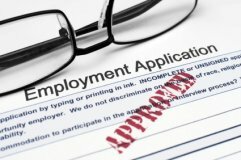 Our consultants possess unique skills and experience which enable them to assist our clients with employment offer formulation and negotiations with job candidates to assure highest possible acceptance ratios. We will provide client employers with a steady flow of resumes of experienced candidates to meet normal hiring needs. We can help employers fill "difficult" openings by using our search capability, which often includes the use of several affiliate recruitment firms who partner with us. Your valuable time is not wasted with unproductive phone calls from inexperienced, high-pressure "employment counselors" who often don't understand your business or your needs. As our consultants become more and more familiar with you and your firm's requirements, you can have greater confidence in their feedback and recommendations. The information obtained as a result of closely working with our staff members can be of great value to our client employers and enables you to extend "acceptable" offers to job candidates more often then if you don't have the benefit of reliable, third party input. Our consultants also have the confidence of the job candidate and will reinforce the benefits of accepting your offer to selected candidates. Your professional job openings are filled in a timely, cost effective manner. Special, hard-to-fill openings can be filled within a reasonable time period. Your productivity and effectiveness in successfully recruiting desirable job candidates improve considerably. Our expert assistance is available when you need it and costs you nothing until a candidate is hired and reports for work. You will experience a noticeable improvement in your offer/hire ratios by closing more "on-the-fence" candidates. New hires will report for work with a confident, positive mental attitude, knowing that they have made an intelligent decision to join your firm. If you have technical recruitment needs, contact us today and let us prove to you how you can benefit from using our services, as have hundreds of satisfied clients since 1965. Contingent Recruiting represents a basic, ongoing recruiting and placement service in which we continue to refer new candidates as they become available until your job requirements are satisfied. Fees are based upon a percentage of salary. Executive/Retained Search provides a concentrated, full resource effort to fill key positions while simultaneously maintaining the strictest confidence of the employer and adhering to their most exacting standards. Details will be furnished upon request. If you have active TS/SCI/POLY clearances, click here now and use your “tickets” to access a variety of rare opportunities of national importance.